Death of a Saint is the second book in the Mall Rats series by a South-African mother-daughter writing team. Except for being original by writing about a non-US/European setting, they also manage to innovate the zombie genre by having realistic characters. The Mall Rats are not very loved in the enclave, and decide to find out what happened to the people outside of Cape Town. Within the group secrets are tearing them apart. For the major part of the book Lele, Ash, Saint and Ginger are on the road. It reads like any other road trip novel to be honest. I’m not really a fan of road trip stories, the constant moving around is pretty boring. Luckily there is intrigue aplenty, as many of the characters are holding secrets. During their travels a few new characters are introduced, which seem to be here to stay. It was interesting to see more of the zombie-infested South-Africa Ms Herne created. 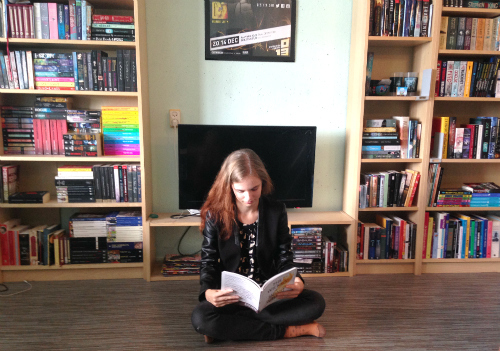 What I like most about these books is that the characters are more diverse than they are in most YA books. There are plenty of black characters, white characters, gay characters, old, young… In the YA genre most books are completely white-washed, and is the gay character doomed to be the stereotypical gay best friend. Saint, the lesbian character, just has so much more to offer than just her being a lesbian. Not in the least the fact that she can kick some serious butts. Though I love the diverse characters, I’m afraid the writing didn’t always live up to that. Death of a Saint is written from the dual perspectives of Lele and Saint, but their chapters sounded exactly the same. So truly the same that I would have to skim back to see who was speaking. I wasn’t expecting their internal monologue to be this similar. The only difference I could discern was that Lele had some inner whining about Ashe, and Saint’s thoughts were more balanced. But I think this dual perspective could have been done better. Saint and Lele in the story aren’t the same person, so their thoughts shouldn’t sound so similar either. Death of a Saint was very much a middle book. It’s interesting in itself, but you get the feeling that it’s a book needed to explain the running up to the third book. It ends on a pretty big cliffhanger. I still really enjoyed the character dynamics (oh and how I love that the main character doesn’t seem to be stuck with a “true love”, but has a normal love life for once). One of the high points of the book for me if when Ginger adopts a baby hyena. I can’t wait to read The Army of the Lost to find out more, because that one promises to be pretty epic. 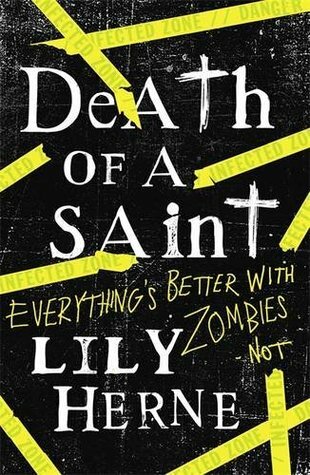 Lele, Ginger, Ash and Saint – aka the Mall Rats – are hiding out in the Deadlands, a once-prosperous area of Cape Town, now swarming with the living dead. Exiled from the city enclave for crimes against the Resurrectionist State, the Rats face a stark choice: return and risk capture – or leave Cape Town and go in search of other survivors.But what if the rest of South Africa is nothing but a zombie-riddled wasteland? Now Lele has discovered the truth about why the lurching dead leave them alone, she can’t bring herself to tell the rest of the gang. And she’s not the only Mall Rat harbouring a dangerous secret… Can the friends’ survive on the road if all they have is each other? Or will their secrets tear them apart?